Congressman Steny H. Hoyer (D-Md., 5th) and Congresswoman Chellie Pingree (D-Maine) have introduced HR 7330, the Agriculture Research Integrity Act, which aims to block reorganization and relocation of federal agriculture research agencies. The bill is cosponsored by Reps. Sanford D. Bishop, Jr. (D-Ga.), Rosa L. DeLauro (D-Conn.), Marcia L. Fudge (D-Ohio), Ann McLane Kuster (D-N.H.), James P. McGovern (D-Mass. ), Eleanor Holmes Norton (D-D.C.), Jimmy Panetta (D-Calif.), and Mark Pocan (D-Wisc.). The lawmakers are hoping to stop USDA Changes. US Department of Agriculture Secretary Sonny Perdue has proposed moving the National Institutes of Food and Agriculture and Economic Research Service away from the Washington, DC, area, as well as shifting authority of ERS from the Under Secretary for Research, Education, and Economics to the Office of the Secretary. 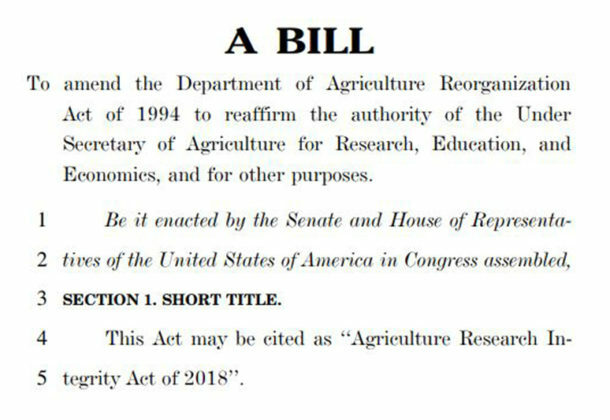 HR 7330, the Agriculture Research Integrity Act, would require the USDA to keep the agencies within the US capital area and keep ERS under the purview of the Under Secretary for Research, Education, and Economics so it can remain free of politicization. Bill text is available here in PDF format. All of the Democratic members of the House Appropriations Subcommittee on Agriculture have signed onto the bill—Reps. Bishop, DeLauro, Pingree, and Pocan—as well as House Agriculture Committee members Reps. Fudge, Kuster, McGovern, and Panetta. Rep. Norton represents her constituents in the capital area.